Arrive at award winning Changi airport, our representative will meet you and transfer you to the hotel for your stay. Later in the evening you can proceed to enjoy the Night Safari. Night Safari is the world's first nocturnal zoo and is one of the most popular tourist attractions in Singapore Overnight stay arranged in Singapore. Singapore is one of those cities of the world that is all dazzle and glamour and is sure to charm all first time visitors. From luxury shopping malls to fine dining luxury hotels, Singapore screams luxury. Singapore as a country has a very diverse ethnic culture.It also has a lot of historic appeal along with its modernism. Overall, a complete delight from a tourist point of view. Singapore is also a popular honeymoon destination of Asia and hence Singapore honeymoon packages are available in abundance as a separate Singapore tour packages for couples only. Singapore tourism sees a lot of Indian crowd every year and Singapore holiday packages from India of all sorts are available. Singapore tour packages from India are of various types depending on the number of days you choose to stay. 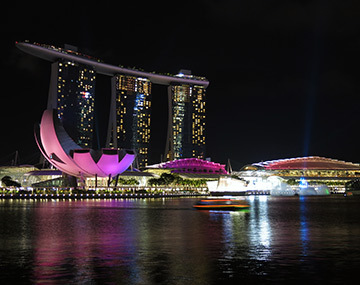 Singapore city tour packages are incorporated in the tour package that you would choose to ensure that the tourists do not miss out on the major attractions. Visiting foreign countries is always done best with the help of a pre-planned holiday package. This way, you would get to cover most of the places and also in a hassle-free manner. Singapore has a lot to offer to all its travelers and if properly planned can be easily covered in a 3 nights 4 days Singapore holiday package. The package that we have carefully designed for you will ensure that you have done Singapore inside out and done it right!The Singapore tour packagesalso take care of all the reservations and logisticsso that as a traveler your holiday remains stress free.Our highly economical plan is one of the cheapest Singapore tour packages that are available in the market and does not burden your wallet much!